For over a century, guests have been coming to our Vermont lake resort to explore, recharge and reconnect with colleagues, friends and family while savoring the timeless beauty of Lake Champlain. Our 700 acres, 150 accommodations, beautiful landscapes and authentic Vermont hospitality will make any event or gathering at Basin Harbor a memorable one. Located one hour south of Burlington, Basin Harbor offers the best of Vermont. It is in close proximity to Burlington International Airport (BTV) and major roadways from the greater New York and Boston areas. 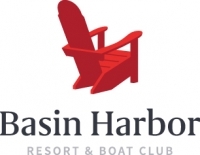 Enjoy Basin Harbor Club with the Vermont Discount Card. Experience our lakeside resort with 20% off rack rate in our charming guest rooms and studios for Spring and Fall. Some restrictions may apply. Not available on holidays.